Be charmed by the mesmerizing natural beauty of Finland, see enchanting Helsinki, spellbinding Savonlinna and the breathtaking Punkaharju ridge during our special 7-day private tour that includes the country's main highlights. * Note for Heritage tours: If you're traveling to Finland with our Heritage program, talk to your destination specialist about available Heritage activities. Welcome to the capital of Finland - Helsinki! Upon arrival your driver transfers you to your modern well-designed hotel for check-in. Following breakfast at your hotel, your private guide takes you on a wonderful 4-hour walking tour to show you the best Helsinki can offer. The rest of the day is free for you to continue exploring the city on your own or joining one of our carefully planned optional tours. 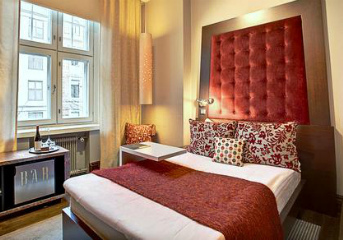 Overnight in your hotel in Helsinki. Following breakfast you check out from your hotel and your driver transfers you to the train station to board the train to Savolinna famous for its picturesque nature. You will enjoy a fascinating 6,5-hour ride across the whole Finland contemplating the magnificent scenery passing by your window. Upon arrival you walk to your centrally-located hotel (easilly accessably on foot). The rest of the day is free for you to have a good rest after the journey or start exploring the surrounding area on your own. After breakfast you meet your guide at the hotel lobby and have an exciting city tour around the most outstanding landmarks of Savonlinna, including the famous Savonlinna Provincial Museum and the Olavinlinna Castle. Later you have the unique chance to enhance your experience of the region taking a magnificent 1,5-hour boat ride around Lake Saimaa. Today we also invite you to have lunch at brewery restaurant Huvila, set in an old villa, with beer tasting of beverages made in the brewery. The rest of the day is free for you to dine in one of the local restaurants, walk along the lake shore or just relax in your hotel room. Optional tour: Savonlinna Opera Festival. In the morning after breakfast you check out from the hotel. Your driver meets you in the hotel lobby and takes you to a beautiful cottage near the breathtaking Punkaharju ridge. Upon arrival you check in the holiday resort and have buffet lunch. Shortly you go on an exciting 6-hour tour of the Ollinmäki wine-yard. Once in the Ollinmäki Wine Farm at Anttola you find out some secrets about the local wine production. You also get to taste the wines, accompanied by the hostess, and even purchase the wines in a local shop if you wish. You are then invited to have a 3-course barbecue dinner at the Anttolanhovi lake-side restaurant. After the tour you return to the resort for overnight. Today you have a unique chance to go on a 4-hour tour of the Rapio Mill called Rapion Mylly by locals and referred to as the "Pearl of Finland". Along the way you pass the picturesque Punkaharju rigde area, famous worldwide for its vistas. The 200-year-old Rapio Mill is one of the oldest operating industrial facilities in the country. It still gets part of its running power from the rapids of Rapio. Grain from the nearby region is processed here into additive-free mill products. You are treated to pastries and snacks made from the local mill products. After the tour you return to the resort and have the rest of the day free. This is the final day of your amazing Finland tour. In the morning you check out from your hotel and your driver takes you to the train station in Savonlinna for your train back to Helsinki. Upon arrival you are transferred to the airport for your flight back home. You are leaving with ultimate experience and bright memories, fascinated by the beauty of Finland. We wish you a safe flight and hope to work on your future trips!